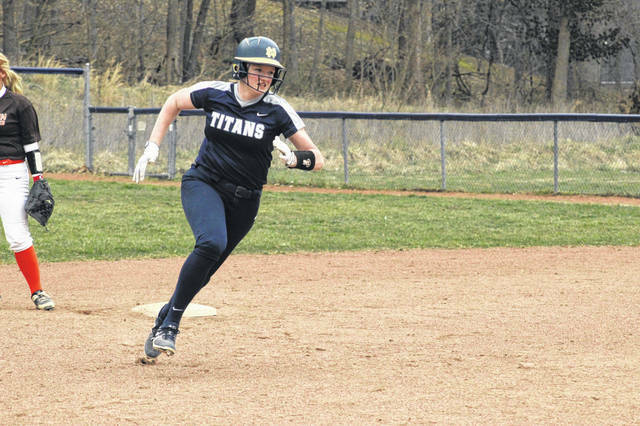 Notre Dame sophomore Claire Dettwiller’s lone RBI helped push the Titans past Ironton in non-league play. The Clay Panthers (6-1, 2-0 SOC II) defeated the South Webster Jeeps (1-7, 1-2 SOC II) thanks to strong pitching and another great day from the Panthers bats. Ace Dakota Dodds had a solid outing in the win going 4.0 IP while allowing just two hits and zero earned runs while striking out four Jeeps batters. In relief, Shaden Malone pitched three innings giving up one hits and two earned runs. Reece Whitley led all Panthers at the plate by going 2/5 with three RBI, a game high. Closely behind Whitley’s efforts were that of Clay Cottle who finished 5/5 in Tuesday’s win with two RBI. Clay will travel to West Union Wednesday for a non-league game with the Dragons while South Webster prepares to face Northwest Wednesday. The Portsmouth Trojans (1-4, 0-1 OVC) picked up their first win of the 2019 season Tuesday against Notre Dame (0-5, 0-2 SOC I), 9-5. Portsmouth is back in OVC action on Wednesday when they will face Coal Grove. Notre Dame will take on Symmes Valley in game two of their conference season series on Wednesday. Notre Dame (7-0, 3-0 SOC I) narrowly squeaked out a win Tuesday vs. Ironton to keep their perfect start to the 2019 season alive. Cassie Schaefer pitched a gem against the Tigers Tuesday, something she’s been known to do in her starts this season. Schaefer went the distance pitching 7.0 IP while allowing just two hits and striking out seven Ironton batters. Claire Dettwiller got one of four hits for the Titans on Tuesday. Her hit also happened to be the only RBI scored between Notre Dame and Ironton, good enough for a one runs Titan victory. Notre Dame will have a quick turnaround before facing Symmes Valley again Wednesday in a road visit to Willow Wood. Another big game at the plate Tuesday night led the South Webster Jeeps (6-3, 2-1 SOC II) to a 14-7 victory over the New Boston Tigers (1-5, 0-3 SOC I). Emma Bailey stole the show by hitting her first home run of the season, going 3/3 with five RBI and a walk. Rylee McGraw followed closely with Bailey’s effort by going 4/5 at the plate with four RBI, a double and a triple included in those four hits. McGraw also pitched 3.0 IP while not allowing a hit or an earned run. Taylen Hickman had the best night at the plate for the Tigers by going 3/4 with four RBI. South Webster will get back into conference play Wednesday against Northwest on their home field. New Boston will travel to Clay Wednesday to try and knock off the SOC I’s top team. The Northwest Mohawks won big Tuesday night in non-league play against Eastern to pick up their first win in 2019 and first under head coach Lora West. In the win, sophomore Haidyn Wamsley went the distance and pitched all five innings while allowing just one hit and striking out six Eagles batters. Addi Newman had an incredible game from the plate by going 2/4, one of her hits being a home run, with a game high five RBI in the win. Laiken Rice and Alison Throckmorton each finished with an RBI apiece in their first win of the year. Northwest will travel to South Webster Wednesday in hopes of exacting revenge on the Jeeps. The Green Bobcats (3-4, 3-0 SOC I) fell to the South Point Pointers in non-league action Tuesday. Ava Jenkins and Cass Kellogg hit the two lone RBI for Green in Tuesday’s six inning loss to South Point. Green will need to rebound quickly for their second game of league play with SOC I rival East. Two Trojans crossed the base path in the third inning, but Portsmouth (2-6, 1-0 OVC) was ultimately unable to overcome their one run deficit, falling to Lewis County (Ky.) Tuesday 3-2. Portsmouth will regroup for another OVC contest with Coal Grove on Wednesday.